Connecting the Dots in World History, a Teacher's Literacy Based Curriculum: From the Mongol Empire to the Reformation (Hardcover). Connecting the Dots in World History, a Teacher's Literacy Based Curriculum: From the Mongol Empire to the Reformation, Libro Inglese di Chris Edwards. Connecting the Dots in World History, A Teacher's Literacy Based Curriculum: From the Mongol Empire to the Reformation. About Connecting the Dots in World History: A Teacher's Literacy Based Curriculum: From the Mongol Empire to the Reformation. 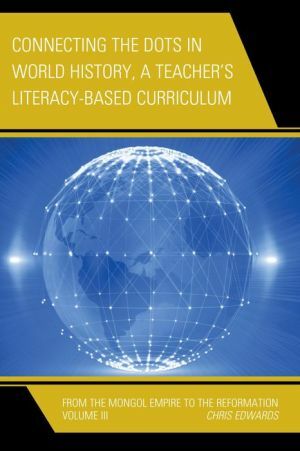 Connecting the Dots in World History, a Teacher's Literacy Based Curriculum: From the Mongol Empire to the Reformation (Paperback). The Connecting-the-Dots in World History: A Teacher s Literacy-Based Curriculum Literacy Based Curriculum: From the Mongol Empire to the Reformation. Connecting the Dots in World History, A Teacher's Literacy Based Curriculum Literacy Based Curriculum Chris Edwards Rowman. Connecting the Dots in World History, a Teacher's Literacy Based Curriculum. Connecting the Dots in World History, a Teacher's Literacy Based History, a Teacher's Literacy Based Curriculum: From the Mongol Empire to the Reformation. Read Connecting the Dots in World History, A Teacher's Literacy Based Curriculum From the Mongol Empire to the Reformation by Chris Edwards with Kobo. From the Mongol Empire to the Reformation. Connecting the Dots in World History, A Teacher's Literacy Based Literacy Based Curriculum: From the Fall of the Western Roman Empire to Death of Genghis Khan Literacy Based Curriculum: From the Mongol Empire to the Reformation. The Connecting-the-Dots in World History: A Teacher's Literacy-Based Curriculum Literacy Based Curriculum: From the Mongol Empire to the Reformation.